Hop off the treadmill and get your cardio in while building strength, agility, and quickness. Cardio doesn’t have to be a synonym for “lame treadmill run.” To keep things fresh, grab an agility ladder, secure a few feet of space, and blast through these speed, agility, and quickness (SAQ) circuits that will torch calories while improving coordination and flexibility. Run through all four circuits (see below) on your cardio day after a dynamic warmup, or work in certain drills after you’ve completed your workout. Stay in a low athletic stance during each agility ladder drill. Getting used to the footwork will take practice. Start slow and add speed as your footwork improves. Execute a body-weight squat and then jump up as explosively as possible. Aim for max height and to extend your body as much as possible as you reach the apex of the jump. Beginning behind the ladder, step into first square with right foot then left foot. Step right foot to right, landing outside the square, followed by stepping left foot outside to the left. Repeat down ladder; switch lead foot on return trip. Perform moving laterally. As you move along the ladder, focus on moving knees past your hips as you drive the opposing arm up. Switch leading leg on return trip. Stand with your feet shoulder-width apart, then quickly crisscross your feet two times (right over left, back to start, left over right, back to start) and then jump as high as possible while trying to bring your knees to your chest. Stand to the right of the ladder. Step inside with your left foot, then your right foot, then step just outside of the ladder with the left foot. Push off of the left foot, repeating the same foot pattern in the other direction then move up the ladder. 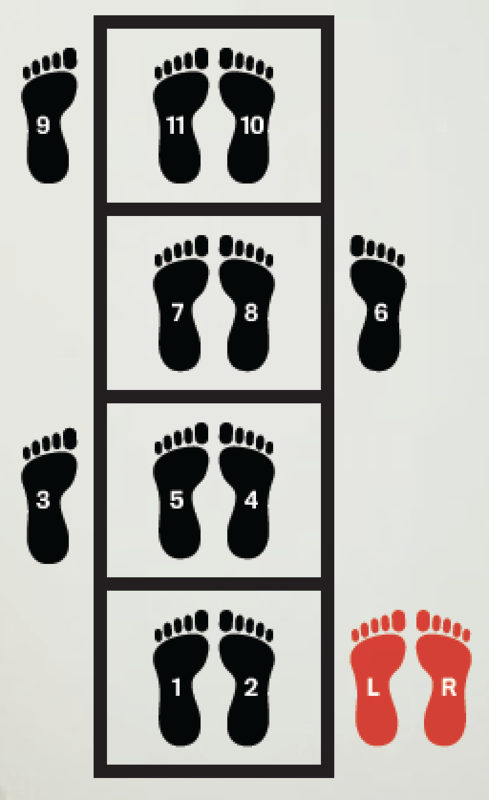 Start to the left of ladder with right foot in the first box. Swing your arms back and propel yourself upward and diagonally, so your left foot lands in the next back; Continue going back and forth diagonally alternating leading leg. In a squat position, jump off one foot and land on the other, moving laterally; jump back and forth. Try and get as much distance from side to side. Only one leg should touch the floor at a time. As you move up the ladder, focus on moving the knees past your hips as you drive the opposing arm up while landing one or both feet inside of each square. Get into a lunge position (right leg forward, left leg back, knee just off the ground). Jump into the air switching your leg position (left leg forward, right back) mid-air and landing softly as you return to the initial start stance.